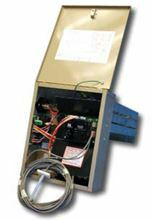 Electro Industries Air Strip Heater or Duct Heater with Warmflo Controlled Element Package - EM-WE2035C and 19200 watts with 15 by 16 Inch element rack. The Electro Warmflo upgrade is a prewired assembly, the complete WarmFlo/strip heater package is as simple as a one control wire connection to any heat pump manufacturer’s unit. As a WarmFlo upgrade package, this is external to the HP manufacturer’s cabinet and does not compromise warranty or other product listings. This Electro EM-WE2035C Duct Heater may have various installation applications. Generic strip heat designed for air handler, heat pump, or blower cabinet outlet duct installation. INTENDED USE – This product is approved and label certified for water source heat pumps or air handlers at the blower discharge. Generic forced air electric resistance heater designed for air handler, heat pump, or blower cabinet outlet duct installation. The relationship of the air moving blower to this insert heater must be according to the specific mechanical installation.